Kenneth E. Hinesman, 84, of Bowling Green, Ohio passed away November 28, 2018. He was born June 30, 1934 in Weston, Ohio to Ernest and Cora (Roe) Hinesman. He married Joann (DuBois) Hinesman April 4, 1954 and she preceded him in death December 17, 2015. Ken worked for Campbell’s Soup from 1973 until his retirement in 1997. He served as the former Mayor of Weston. He was a hard worker and held a variety of other jobs throughout his life including two milk delivery services for Village Farm and Meadow Gold, Metal Cabinet Company in Maumee, Ohio, Mid-Wood and a gas company in Cygnet, Ohio, delivered supplies for the State of Ohio and was an employee of the Sentinel-Tribune for a few years delivering papers. When Ken wasn’t working, he enjoyed watching his children and grandchildren participate in their sporting and musical events. He loved taking his family on vacations to Walt Disney World, Myrtle Beach, New Mexico and Colorado. 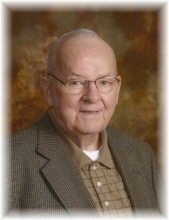 Ken was an avid bowler for many years in the coed leagues at Varsity Lanes in Bowling Green. He is survived by his children Tina (Rick) Vogelbacher of Maumee, Ohio, Kathy (Wade) Loomis of Pemberville, Ohio, Amy (Mike) Barbour of Bowling Green, Ohio and Sara (Roger) Stalets of Bowling Green, Ohio, 13 grandchildren and 16 great-grandchildren. He was preceded in death by his wife Joann and son Kenneth “Cub” Hinesman. Visitation will be held on Sunday December 2, 2018 from 2:00 to 5:00 p.m. at Dunn Funeral Home, located in the Historical District of Bowling Green at 408 W. Wooster St. His funeral service will be held on Monday December 3, 2018 at 10:30 a.m. at the funeral home. Pastor Andrea Curry will officiate. Interment will follow at Oak Grove Cemetery in Bowling Green. Memorial contributions may be given in his memory to the American Red Cross for wild fire relief. To send flowers or a remembrance gift to the family of Kenneth E. Hinesman, please visit our Tribute Store. "Email Address" would like to share the life celebration of Kenneth E. Hinesman. Click on the "link" to go to share a favorite memory or leave a condolence message for the family.